This puzzle is sometimes referred to as one of the hardest logic puzzles in the world. Since I was able to solve this one, but not the other world's hardest logic puzzle, I'm giving that title to the other one, but this one can still be pretty difficult to solve. The puzzle is as follows: There's an island with people who have all sorts of eye colors, but nobody knows the color of their own eyes. They're all perfect logicians, so any conclusions that can be made in regards to eye colors will be made. If somebody figures out their own eye color they will have to leave the island on a ferry that comes every night. There are no reflective surfaces however, and nobody talks about each other's eye color in any way, so figuring out your own eye color requires some logical thinking based on new information. This knowledge comes in the form of a statement made by the guru. One day the guru states that they can see someone who has green eyes. Let's say there are 100 people with blue eyes, 100 with brown, and 100 with green, and let's say the guru has blue eyes. Who leaves the island, and on what day? This puzzle can be adapted in many ways, and the amount of people can be changed without greatly affecting the answer, as you'll see below. The riddle can be spiced up with some story relevant details as well, perhaps the people are cursed, and therefore unable to communicate until they leave the island, perhaps there guru is replaced with the party who accidentally reveal the information (for better or worse), and so on. The answer is that all 100 green eyed people will leave on the 100th night. Likewise, if there were 50 green eyed people they would leave on the 50th night, as would x number of people leave on night x. To understand this it may be helpful to start of with just 1 person, then 2 people, and then 3. So, let's start with 1 person. This person knows there are at least 100 blue eyed people, and 100 brown eyed people. They don't know what color their eyes are, so for all they know there could be 101 blue or brown eyed people, or they themselves could have any other eye color. So when the guru states there is a person with green eyes this person knows they're the one, so they leave on night 1. Simple, right? So let's say there are two people with green eyes, they both know there are at least 100 people with blue eyes, 100 with brown eyes, and 1 with green eyes. When the guru says there's a person with green eyes they will both assume it's the other one. In this assumption they also assume this person will leave that night, and that they themselves don't have to leave. 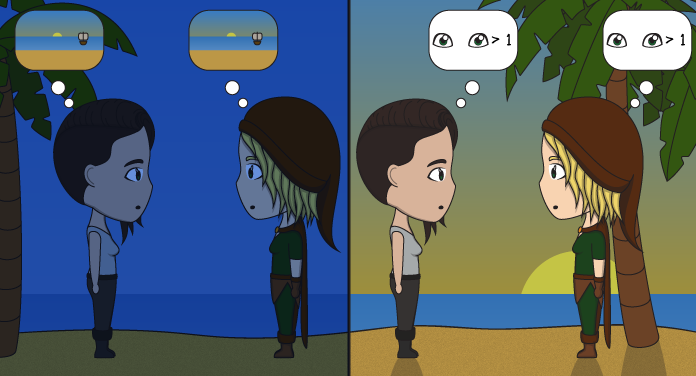 A night passes, they then both see the other hasn't left the island. This can only mean that they were both expecting the other to leave, and therefore they must both have green eyes. Having figured this out they both leave on night 2. Now let's say there are three people with green eyes. It goes roughly the same as in the case of two people, but with one minor change. Each green eyed person thinks there's two people with green eyes, and knowing that it would take them two nights to figure out each other's eye colors they all expect the other two to leave on night 2, as per the previous example. When this doesn't happen they once again come to the conclusion that they too must have green eyes, as the others were expecting them to leave. Therefore the three of them leave on night 3. The same goes for the 100 people, and the same would go for 500, 1000, and 1,000,000 people. The difficulty in this puzzle lies within the fact that people have to wait to verify what they already know. They know there are at least 99 people with green eyes, so surely they don't have to wait 99 nights to verify this? You're somewhat right in thinking this, but you forget that each person within those 99 thinks they're not part of that 99. Each person also knows that every person within those 99 don't know their own eye color, so that takes some time to verify, as I've shown in the example with 3 people. Once you realize that each person is waiting for the others to verify their own eye colors with each other the entire puzzle becomes far easier.